In 2010, we at the JAPCC took a hard look at ourselves to ensure that all of the work we undertake remains relevant to NATO and the Nations. If we are to do this effectively we must ­rigorously apply best practice to our research processes and to the presen­tation of our results so that we con­tinue to provide the best military ­advice. The ultimate aim was to build upon our hard-earned reputation as NATO’s pre-eminent advocate for the de­velopment and enhancement of Joint Air & Space Power. With this in mind, we adopted the strapline of Relevance, Rigour, and Reputation. Relevance to make sure that our products are current, expressed as simply as possible and are useful to those requesting and receiv­ing them. We must apply increased Rigour to our work to ensure that our staffing processes, our approach to research and our presentation of the results are all con­ducted to the highest possible standard. Our Reputation is underpinned by our Relevance and Rigour and ensures that whenever we represent the JAPCC on paper or in person, our commitment to the organisation and what it delivers, and our expertise and pride in our subject, determines the way we are viewed by others. Another aspect of our self-assess­ment was orchestrated through our Sponsoring Nations in the form of an Executive Working Group (EWG). The first EWG meeting was convened to ­discuss past, present and future projects. We gained useful insight, and it brought us closer to the Nations without whose sup­port the JAPCC would cease to exist. This inaugural meeting was a major ­success, and I look forward to host­ing the next meeting of this annual JAPCC event. We can be proud of our achievements this year, which you will see summarised in this report. I have included some key highlights to illustrate the importance of our work. High on our list of achievements has been our support to current operations in Afghanistan, particularly in the area of countering Improvised ­Explosive Devices (IEDs). In September 2010 we produced a primer to sum­marise the ways and means by which Alliance Air & Space Power can contribute to defeating this particular threat. Additionally, we published a primer on Personnel Recovery; truly a Joint effort which underpins the moral component of warfare and invariably attracts the most intense public scrutiny. Furthermore, we continue our engagement in the topic of Forward Air Controllers through the work being done in our Air-Land Integration study. JAPCC has and will remain involved in subjects included in the new NATO Strategic Concept, such as Missile Defence, Command and Control Organisational concepts, and strategic issues concerning the Air & Space domains, which are now defined as our Focus Areas. As you will see, there are many other ­important aspects of our work that our multi­national staff, drawn from 17 Nations, has produced. I encourage you to read the summary and, should you have any questions, to either visit our website or call us. We want to encourage an open dialogue with our stakeholders. I am pleased to report that our staff numbers have remained stable this year at around 85% of the established strength, albeit with some significant turnover. I am pleased to introduce our new Director, General Mark Welsh III; he brings a wealth of experience from both an operational and academic perspec­tive. We look forward to his direction and guidance. Additionally, I assumed the Executive Director Post mid-year and I am thankful to Lieutenant General Ploeger for all he has done to endorse and promote the work of the JAPCC. Our Subject Matter Experts, the core of this organisation, continue to remain strong. Whilst a degree of ebb and flow in our manning is inevitable, it is clear that our Sponsoring Nations continue to provide highly competent personnel to fill a wide variety of positions, and for that I am most grateful. Our Annual Conference continues to ­attract some of the finest thinkers and proponents of Joint Air & Space Power. We reported last year that we were at maximum capacity but this year we exceeded the numbers once again, with over 270 participants from across NATO and many other Nations. Furthermore, we published two editions of the JAPCC Journal and will continue the successful distribution of this product in order to share our ideas, and those of our contributors, as widely as possible. I want to especially thank our commercial partners, who have not only contributed to our publications, but have also provided sponsorship to allow us to produce and distribute these documents. 2010 was a successful year in supporting NATO and our Nations. 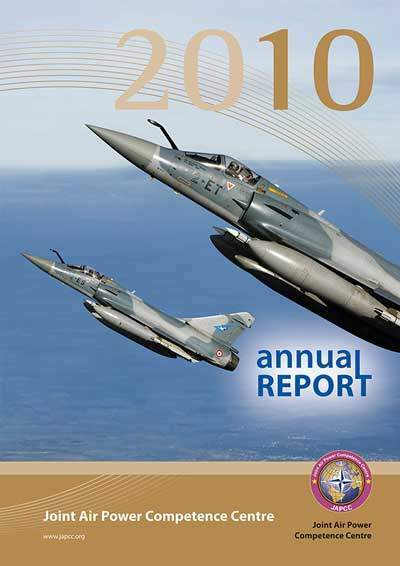 We now look forward to 2011 determined to continue to work on innovative ideas for the transfor­mation of NATO Joint Air & Space Power.